McDonald’s! 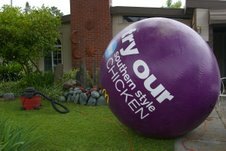 John Vonderlin Wants to know: Is This Your Balloon? This was one of my finds yesterday. 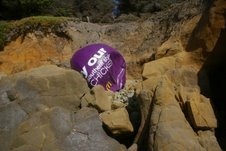 Before I start calling around to find its owner or former owner, as the case may be, I was wondering if the McDonald’s in Half Moon Bay is missing their’s? Thinking about it, I’ve decided to use it as the Queen Bee of my , “The Party’s Over,” piece of Marine Debris artplay. That consists of large glass spheres packed with my collection of the remnants of thousands of balloons of every type and their ribbons, etc. that were carelessly released into the environment to foolishly celebrate various events and subsequently washed ashore.